If you’re one of those people who regularly misplace your keys, your TV remote, your wallet and anything else that’s small enough to disappear, you need a way to keep track of your stuff. 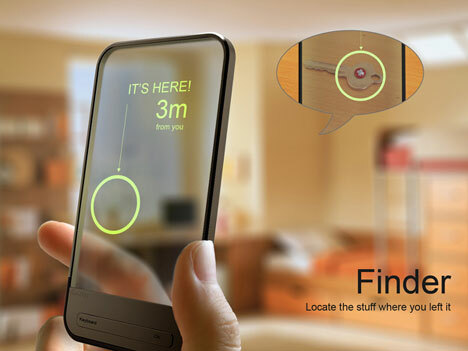 The Finder is an RFID location device that uses a transparent touchscreen device and a sheet of locator stickers to help you find all of your little lost things. 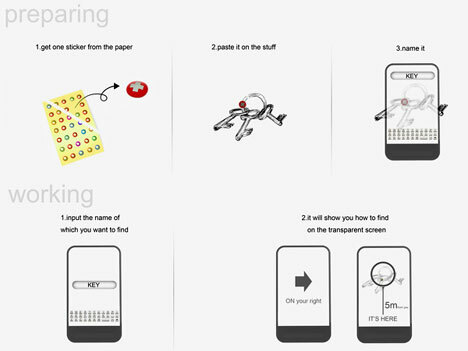 Just peel a sticker off of the sheet and stick it onto your stuff, then the handheld device can tell you just where it is. The concept was designed by Chu Want, Qiujin Kou, Qian Yin and Yonghua Zhang – and it looks like a cool futuristic twist on the numerous other “finder” devices out there. The handheld device guides you to your items, taking you turn-by-turn right to your stuff’s hiding spots. You’ll never be late again…well, not because of lost keys, anyway.